It was the middle of the night when they broke down the door. The children, aged 3 and 6, and their parents were all fast asleep in their home in Pimienta, a town 18 miles south of San Pedro Sula, in northwestern Honduras. “They arrived at three in the morning,” said the mother of two whose home was raided. U.S.-trained and supported special forces agents, known as TIGRES, as well as criminal investigation officers searched the family home, flipping over the beds and ripping pillows apart while she and her children watched. Her partner had already been handcuffed and taken outside. According to Honduran law, search warrants should only be executed between 6 a.m. and 6 p.m., but there have been numerous reported cases of nighttime raids by security forces over the past two months, as the Honduran government cracks down on protests against the contested elections that delivered the presidency to incumbent Juan Orlando Hernández in November. The Honduran Secretariat of Security claims that the raids and arrests in Pimienta were conducted legally, based on reports from the community, covered by arrest warrants, supervised by a prosecutor, and carried out during the hours allowed by law. Bulletproof police vests and looted items were confiscated during searches, a spokesperson for the Secretariat wrote in response to questions from The Intercept. Yet all of the accounts of the raids and arrests from Pimienta residents and witnesses tell a different story: nighttime and dawn raids, terrified children, and TIGRES involvement. Some residents were told there was a search warrant and others weren’t, but no one remembered seeing one. All in all, security forces carried out 10 raids in the early hours of December 26 and arrested 11 Pimienta residents on charges related to property destruction and assault on police officers in the context of protests against election fraud. TIGRES special forces have been controversial since their founding in 2013, and their short history has been dogged by allegations of theft and corruption involving drug traffickers. Trained in Honduras and in the United States by Green Berets from the 7th Special Forces Group (Airborne), the TIGRES receive substantial support from the U.S. State Department. And they have been active participants in government repression during the current political crisis in Honduras. Hernández was sworn in for his second term on January 27, two months after the November 26 general elections were marred by widespread reports of fraud. An early 5-point lead favoring opposition candidate Salvador Nasralla evaporated after the election data transmission system went offline for hours. Observers from the Organization of American States documented a host of irregularities and refused to endorse Hernández’s victory, claiming it was impossible to have any certainty about the outcome. Within days of the elections, opposition supporters took to the streets around the country, defying a state of exception and curfew to protest election fraud. The rallies, marches, and highway blockades that rocked the country for two full months still continue here and there. The government response has been an ongoing violent state crackdown, with security forces opening fire on protesters on multiple occasions. More than 35 protesters and bystanders have been killed by security forces and other unknown perpetrators, hundreds injured, and more than 1,000 detained. At least 22 people remain in jail in different parts of the country on charges related to protests. The Trump administration has supported Hernández — a longtime U.S. ally in the region — as the victor of the election, and security assistance continues to flow. The State Department issued a certification back in November, two days after the contested election, allowing Honduras to receive millions of dollars of aid that was conditioned on progress with regard to human rights and corruption. Supporters of the Opposition Alliance Against the Dictatorship protest against the reelection of President Juan Orlando Hernández, outside the United Nations building in Tegucigalpa, on Feb. 9, 2018. The government crackdown has been particularly violent in northwestern Honduras, in the departments of Cortés, Atlántida, and Yoro. Opposition alliance support is strongest in the region, which also drives the national economy, and protesters have been blocking key highways off and on for months. Joaquín Mejía, lawyer who works as a human rights researcher for the Reflection, Investigation, and Communication Team, know as ERIC, a Jesuit-run advocacy group, cites the region’s long history of belligerent resistance as a key factor behind both the outpouring of protests and blockades and the ensuing repression and militarization. “Military forces acted as though they were in a war zone, in the sense that they continued with the rationale of firing live rounds at the people who were protesting – an unarmed population,” Mejía told The Intercept in ERIC’s office in El Progreso, Yoro. Security forces also fired tear gas indiscriminately, including into people’s homes, and subjected detainees to cruel and inhumane treatment, Mejía said. “They entered homes without search warrants,” he added. “Members of the [national police] institution only carry nonlethal weapons to discourage violent acts and during evictions [of protests] police procedures seek to avoid damages to third parties,” the Directorate of Strategic Communication of the Secretariat of Security said when asked about reports of excessive use of force, including firing live bullets. “The National Police undertakes all of its actions in compliance with the law, with strict respect for human rights and the police procedures established in the United Nations’ Manual on the Use of Force,” the Directorate wrote to The Intercept, although it is unclear exactly what document they are referring to. However, the Honduran office in the Office of the United Nations High Commissioner for Human Rights has made public statements condemning the government’s use of excessive force against protesters, as well as attacks on human rights defenders and media workers. The carrying and firing of weapons by security forces during evictions of protests has been widely documented in photographs, videos, media reports, and by human rights groups. The TIGRES were created by law in 2013. Hernández, president of the National Congress at the time, had proposed the bill. Training of TIGRES agents began in 2014, after Hernández assumed the Honduran presidency. Green Berets from the U.S. Army’s 7th Special Forces Group (Airborne) and members of the Comandos Jungla, an elite force of the Colombian police, trained the TIGRES agents, who were recruited from Honduran police and military forces. The June 2014 graduation of the first wave of TIGRES was attended by Lisa Kubiske, U.S. ambassador to Honduras at the time. The Green Berets and Comandos Jungla instructors trained another class of TIGRES in a 12-week Comando basic course the following year. According to a Facebook post from the U.S. Department of State’s Bureau of International Narcotics and Law Enforcement Affairs, or INL, as of mid-2015, a total of 322 agents had completed the course, which is the basic training for all TIGRES. In February 2015, TIGRES agents traveled to the Eglin Air Force Base in Florida for two weeks of advanced training from the 7th Special Forces Group (Airborne). Along with marksmanship, urban combat training was a key component at Eglin. In 2016, members of the TIGRES and of the Honduran Army completed special training with the Task Force Caiman, imparted by members of the Florida National Guard. TIGRES have also participated in at least one interagency medical mission led by the U.S. Southern Command, whose Task Force Bravo is based in the Soto Cano joint base, located 50 miles northwest of Tegucigalpa, the Honduran capital. The U.S. Department of State, by way of the INL, supports the TIGRES and several other Honduran special forces and units with a mix of training, funding, vetting, and advising. The INL has also contributed funding for the construction and furnishing of a second TIGRES complex, in El Progreso, the ground-breaking ceremony for which was held in January 2017. The other TIGRES installations are located in Lepaterique, 25 miles west of Tegucigalpa. La Tolva prison, 40 miles east of the Honduran capital Tegucigalpa, where protesters are being held in pretrial detention. Three days after the December 26, 2017 arrest of 11 Pimienta residents by TIGRES and other law enforcement officers, more than 20 relatives of the detainees were gathered across the street from a San Pedro Sula courthouse, awaiting news from the hearing underway inside. Several relatives spoke with The Intercept, but all requested anonymity due to security concerns. 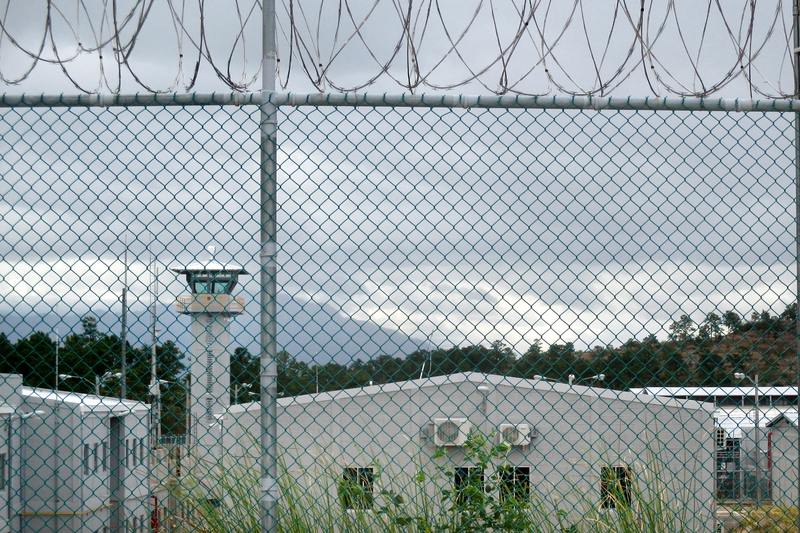 “There’s fear, a lot of fear,” German Ovidio Silva, a local evangelical pastor in Pimienta accompanying some of the detainees’ relatives in San Pedro Sula, told The Intercept. “More than anything, I’m worried about the youth in our municipality,” he said. Silva has been a pastor in Pimienta for the past 14 years. He has known most of the arrestees for years, many of them since they were children; they’re mainly hard-working youth, he said. While some may have participated in opposition protests, he claims they had nothing to do with the incidents of arson and assault on police officers of which they stand accused. In December, four police officers were disarmed and stripped down to their underwear in the midst of protests in Pimienta. The government says the officers were attacked and assaulted by protesters, and photographs appear to indicate that they were beaten. Pimienta residents say the agents had infiltrated protests, and so they were removed, disarmed, and held to prevent them from instigating violence. They were eventually handed over to other security forces. A fire was also set inside the police station in Pimienta. Amid protests in December, several police stations across the region were targeted with arson and other damage. According to opposition protesters, the damage to police stations was inflicted in direct response to security forces opening fire with live rounds during evictions of highway blockades. Silva spent three years in the national police force in the 1990s and believes those responsible for any crimes in Pimienta should face justice, but he is critical of the raids and arrests. Locals are afraid of the authorities, and residents are being tried in the media as criminals, he said. All 10 of the men arrested in Pimienta (one of the arrestees was a woman) had their heads shaved before they were perp-walked into their December 29 hearing. More recently, TIGRES agents were involved in the arrests of seven people in Villanueva, including Javier Rubí, an elected municipal council alderman from the opposition alliance. They were accused of charges related to arson and damages at the Villanueva police station. All seven were released after a week due to lack of evidence. Longtime activist Edwin Espinal and another protester, Raúl Álvarez, had no such luck. Facing three charges related to property destruction at the Marriott Hotel in Tegucigalpa during a January 12 protest, they are in pretrial detention in the La Tolva prison, 40 miles east of the capital. A small army encampment is located directly across the highway from the jail. No reports have yet emerged of violent mistreatement at La Tolva, although Espinal and Álvarez were in solitary confinement cells for 22 hours a day during their first two weeks there, and neither has yet been able to receive any visit from relatives. 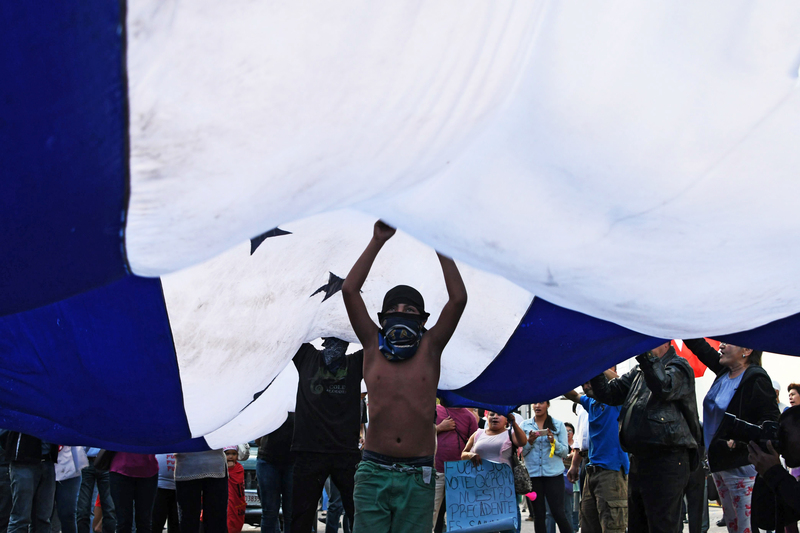 But previous generations of SOA graduates were among the worst human rights violators in Central America during the 1980s, and it is that precedent that makes Honduran activists nervous about U.S.-trained troops turning on protesters. “We’re going to go back to the old days,” said Bertha Oliva, coordinator of the Committee of Relatives of the Detained and Disappeared in Honduras. Things may get worse, because along with past practice, state security forces are now better trained and better equipped, she told The Intercept. “Today they have all the experience, all the expertise, and they know that nothing happens to them with any kind of human rights violations committed — whether individually or collectively — against the citizenry,” she said. Top photo: A police TIGRES squad patrols during an operation in Los Alpes, in the southern outskirts of Tegucigalpa, Honduras, on Sept. 29, 2015, following a clash with alleged members of the Mara 18 gang that left two dead. The post U.S.-Trained Police Are Hunting Down and Arresting Protesters Amid Post-Election Crisis in Honduras appeared first on The Intercept.